The Club has published its first Annual and it will be on general sale in local shops while stocks last. It’s great value and rounds up the historic year for our local Gaelic Football Club. Contact Joe O’Connell 087 9333181 or any Club Officer for further details. Our u-14 ladies team defeated Leitir Mor in the County league final in Killanin on Saturday last. Claregalway started well and scored the opening three points.Leitir Mor came back into the game but goalkeeper Siobhan Cullen and the defence dealt with anything that came their way.A goal before half time saw us go in at half-time 7 points clear. In the second half our mid field and forwards gave a fine display and we eventually overcame a gallant Leitir Mor team. Thanks to Walter Butler who refereed the game and also to Catriona Kyne who presented the trophy.Also thanks to Gerry Moran and Marion O’Connell for all their help during the year. 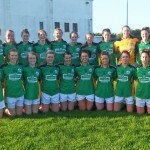 Team: Siobhan Cullen, Selina Hession, Helen Moran, Chloe Ryan, Amy Rohan, Aisling OBrien, Ashley OConnell, Fabienne Cooney, Clodagh Rafferty (capt), Emma Devaney, Ciara Newell, Aine Brennan, Charlotte Cooney, Deirdre Brennan, Alex Clancy, Lauren Murray, Aisling Glavin, Laura Costello, Lorraine Keane.